Dov Hikind rides on bus with ads depicting Ayatollah Ali Khamenei thanking US for the deal to convince politicians to change their minds. Assemblyman Dov Hikind (D - Brooklyn) promoted an anti-Iran parody ad campaign Friday, by riding a bus with #AyatollahThanksAmerica ads throughout New York. Hikind made stops at the offices of Senator Kirsten Gillibrand and Representative Jerrold Nadler, both of whom recently declared support for the deal between the West and Iran, as part of satire tour “thanking” members of Congress and the American people. 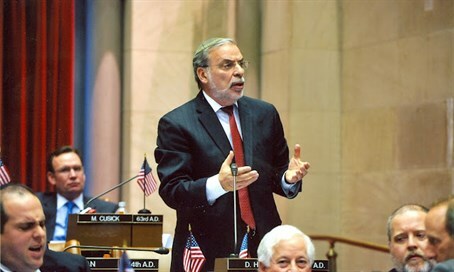 “Today we stood outside of Gillibrand’s and Nadler’s offices to make our voices heard and urge them to reconsider their support of the Iran deal," Hikind said in a statement. "Our community is massively disappointed in their decision." "With the recent AP report of one of the side deals reached between Iran and the UN’s International Atomic Energy Agency, the latest news reads like a headline from the Onion," he continued. "So we decided that satire is the best way to demonstrate this point." "One only needs to listen to the chants of ‘Death to America’ and read the fine print from this deal to realize we are headed down a perilous path," he added. "Americans overwhelmingly think Congress should reject the deal. And indeed, with each passing day, it becomes clearer that the Iran deal is disastrous for the United States and our allies." "Many members of Congress have eloquently put forward reasons why this deal must be rejected," Hikind urged. "It’s time for Democrats in Congress in favor of this deal, including our very own Senator Gillibrand and Rep. Nadler, to reconsider their support." Hikind has been a vocal opponent of the Iran deal, and recently was arrested at a protest against the agreement struck with the Islamic Republic.